Despite a bipartisan recommendation to drop the sedition provisions from Howard’s terror law proposals, Federal Attorney General Philip Ruddock is wedded to the idea of criminalising criticism of the government. Ruddock wants the power to silence critics with a threat of up to 7 years imprisonment. The proposed sedition law as written will remove the test of ‘overthrowing the government by force,’ thus making an offence of mere commentary which "urges disaffection against the Government." Ruddock says, "What I want to pursue is that the law operates as intended." Beware Ruddockspin. What is written is what is intended. Bloggers and journalists will be primary targets of ministerially enforced silence. While some argue that section 24F, the ‘Good Faith’ provision, will exempt political commentators and journalists, this appears to be at ministerial discretion. You can presume that Ruddock is the worst case for an Attorney General. If any legal sanction is possible, you can be sure Ruddock will exercise it. If we don’t want people jailed for criticising the government or detained incommunicado without appropriate, confidential access to legal counsel, it should never be legally possible for the Attorney General to do so. 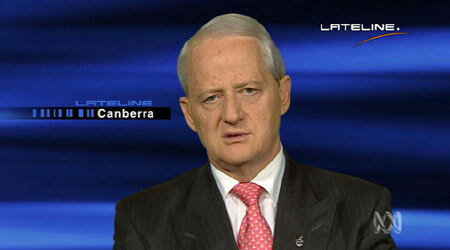 Ruddock wants the laws passed as drafted and proposes to fix them later. This is a bear trap. Once the government has the power to detain innocents, it will not give it up easily. Australia will then have the distinction of having genu-wine 100% political prisoners. This is a power no government should have for 10 seconds, much less for 10 years until the proposed sunset provision kicks in. Don’t be fooled. These powers will only be used to protect the government from criticism, not protect Australians from terrorism. It’s hard to make a comment on this without launching into a tirade. What kind of Attorney-General, in their right mind, would even suggest implementing such a law that is so easily open to abuse, and suggesting they’d fix it later? Unless, of course, they intended to abuse that law. How long would it take to redraft the sedition section? I’m guessing min. 5 minutes, max. one day. Not a lot of work there. Evan, you’ve sussed out Ruddockspin! Really? Well if I can do it with a bottle of Riesling accounted for, what’s wrong with everyone else? Evan, I reckon it’s because some people are just not paying attention. If one does not recognise the phrase “We’re from the government- and we’re here to help” as an oxymoron, one must not have all the wires connected. The problem is that Ruddock is even more cynical than I am. He thinks the sedition provisions are a very funny joke- on us. I’m wondering what they’re going to come up with next that is going to need sedition laws. JT, sedition is kind of a catch-all. All you’ll need do is ‘urge disaffection against the government.’ Sedition laws have traditionally been used in Australia to suppress dissenting speech. Yeah, that case cited in Wikipedia is one of the most incredible things I’ve ever seen! Encouraging indigenous people to demand control of their own land equating to sedition is madness. And the proposed laws are tigher than the ones that eventualy sent Mr. Cooper into the great beyond. Once again, I’ve got a bottle and a bit of wine accounted for, and I can see it. What’s wrong with the rest of the population? So commenting about IR reforms also constitutes sedition. I’m actually a bit surprised by the anti-government cartoons in the Courier Mail, Rupert’s Queensland publication. Have a look at this and this.